Every year we take Lee to a concert or a Broadway show for his birthday. 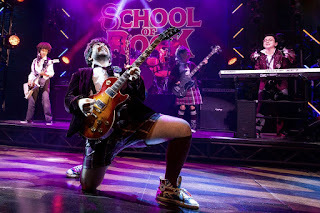 This year he chose to see School of Rock. We saw the movie a few years ago, but live music is always better. The show follows Dewey Finn, a failed, wannabe rock star who decides to earn a few extra bucks by posing as a substitute teacher at a prestigious prep school. It includes 14 new songs by Andrew Lloyd Webber and all the original music from the movie. After the show, we wanted to eat at Ellen's Stardust Diner, but the line to get in was literally a block long. It seems that after the matinees ended, people just flocked there. It seems that the best way to get in is to go while shows are in progress. We haven't been there in a few years, but we really enjoy the singing waiters and waitresses. Instead, we ate at TGIFridays.